So my busking adventures continue – I was at my second home, Bond St tonight – quite quiet, lots of small change dropped, but also lovely stuff like the lady who gave me a rose and the other who said I was the best thing she’d heard on the tube [compared to the coaches on the Bakerloo Line, presumably 🙂 ]. Thanks to everyone who’s come to see me so far – Emma, Russell, Jamie – and all those who’ve sent warm wishes via twitter. I’m having a great time with it. Counting the money is giving me lots of fun. I have a spreadsheet going with the following metadata: date, day, time, location so that I can do some analysis. So far I’m averaging a bit more than minimum wage… but not quite up to my consulting day rate. No matter, the most important return I get is something I’m not quantifying precisely: the number of smiles and winks. Today I met a Busking Manager for the first time. These guys get to go round the network, checking in with buskers that everythings alright and making sure that people have turned up to the right pitch at the right time. I’m also getting to meet more and more of my fellow performers. Most are really nice, but I have to say that a number of them are just bloody miserable, I suppose it’s like anything, but I do think there are a few who buy in so much to the suffering artist myth that nothing could make them happy. The most obvious thing I’ve learned is that people with shorter legs walk more slowly than those with long legs. It’s really noticable when a train comes in, the crowd just gets shorter as it passes by – you just don’t see these things when you’re in the crowd yourself. Bring back memories. 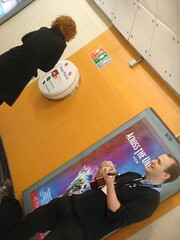 I spent a week busking in the Paris Metro many years ago and often think of doing it again just for the hell of it. At last! Now I know why I always seems to be the last person to reach the escalator. The answer is in my jeans! This finding is worthy of a name with capital letters, like Lloyd’s Law. @stuart – mmm…. I’m flattered of course, but I think Mr Darwin got there first!